Evocative of Van Gogh's Starry Night, this handmade bowl features swirls of color. "The sight of the stars always makes me dream," Vincent van Gogh once wrote. 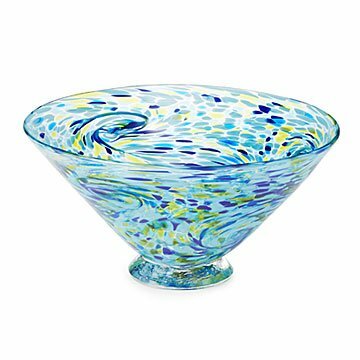 Inspired by the artist's dreamlike painting The Starry Night, this handmade bowl features swirling gestures of blue and green glass worthy of the impressionist icon. Glass artists Mariel Waddel and Alexi Hunter start by rolling molten clear glass in flecks of colored glass, and then use tools to twist these confetti-like infusions into captivating swirls. They blow this multi-colored mass into a graceful bowl, add the base, and cool the piece gradually to completion. Handmade in Kingston, Ontario, Canada. Glass artists Alexi Hunter and Mariel Waddell Hunter have been blowing glass professionally in their Kingston, Ontario studio for over a decade. Their designs are inspired by the tropical islands where Mariel has lived, the rural farms where Alexi was raised, and the gestural genius of artists like Van Gogh. Their different backgrounds, creative passion, and mutual love of glass gives them the foundations for a thriving business. This is a stunning bowl with beautiful colors that add a special touch to any room! I imagine the bowl will be more decorative than used for food service.